This is a wonderful mix that has a nice Pomegranate taste. Can be made as a Martini or as a wine Blizzard slush drink. Make with either white wine or Vodka. Wine Blizzard Slush Option: This makes a super tasting wine slushie drink when dry white wine is used. Based on a56 oz. blender, just add a package of the mix, 3/4 bottle of white wine (750ML bottle) such as Pinot Grigio or Chardonnay, fill with ice. Enjoy a wine slushie Pomegranate drink. 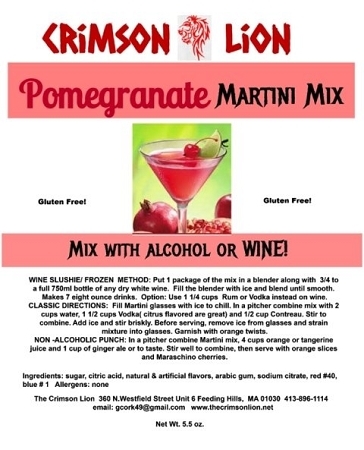 Vodka option: Fill blender with ice, add in 1 package of the mix, 1-1.5 cups of vodka, 1/2 cup water and blend for a great tasting Pomegranate slush drink.